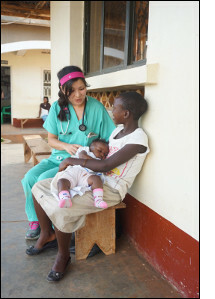 During our two weeks in Uganda, a team of family medicine doctors volunteered in a rural health care clinic in Ddegeye, called Engeye. There we not only cared for the village inhabitants but collaborated with the Ugandan clinical officers in educating one another on topics such as: yellow fever, malaria, back pain, breast feeding, and women’s health/reproductive education. The healthcare model in Uganda lacks continuity and education. We focused on educating patients on chronic conditions such as osteoarthritis, hypertension, and diabetes. On any given day, anywhere from 110 to 60 patients showed up to be seen. Chief complaints ranged from severe malaria to hypertension management to We also started an educational program to teach girls how to make reusable sanitary pads. The two part series included education on menstrual cycles and also how to sew and use the pads. Embarrassment and lack of understanding of their menstrual cycles is a leading cause of school dropout amongst teenage girls. By empowering these girls and women to understand their menstrual cycles and giving them a tool to benefit themselves and other girls in their village, we hope to encourage them to stay in school.